Larry King: Tell me about Joyful. Larry King: Meaningful title, it's a happy song I would guess. Sam Harris: It's a song about struggling to find ways to be grateful and appreciate what you have in life when in the midst of any personal turmoil or struggle that you are going through. I wrote it at the time when I was, we had just gotten off tour, and I had gone through an experience with a dear friend of mine struggling with substance abuse and had been really affected by that and was feeling very low. And I wanted to try and find some way to pull myself out of it and figure out how to focus on the good things that I had in my life. Larry King: So it's an up song? Sam Harris: Yeah, it's an uplifting song. Casey Harris: It's almost, it's about when times are the hardest, that's when you have to find the beautiful things in life to be grateful for, I guess, and you find the things that make you happy. Larry King: Did you treat blindness that way? Casey Harris: Oh, yeah, I mean, I've tried to treat everything in my life that way. I mean, it's with varying degrees of success, of course. But it's always sort of that's the end goal is to learn to appreciate everything and learn to appreciate especially all the good points in life, despite all the bad things that are happening. 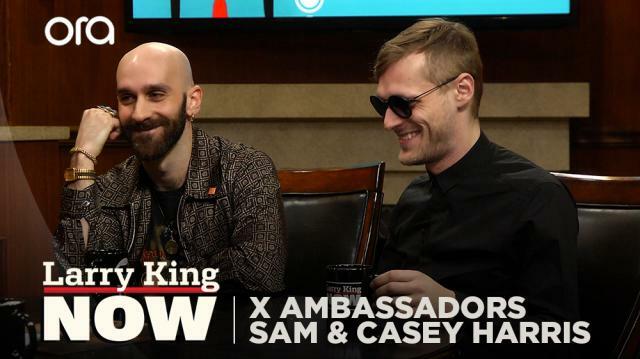 Sam Harris: Yeah, Casey's a huge inspiration to me and that song was kind of written about. Larry King: Grateful's a good word. We ought to be more grateful for a lot of things.